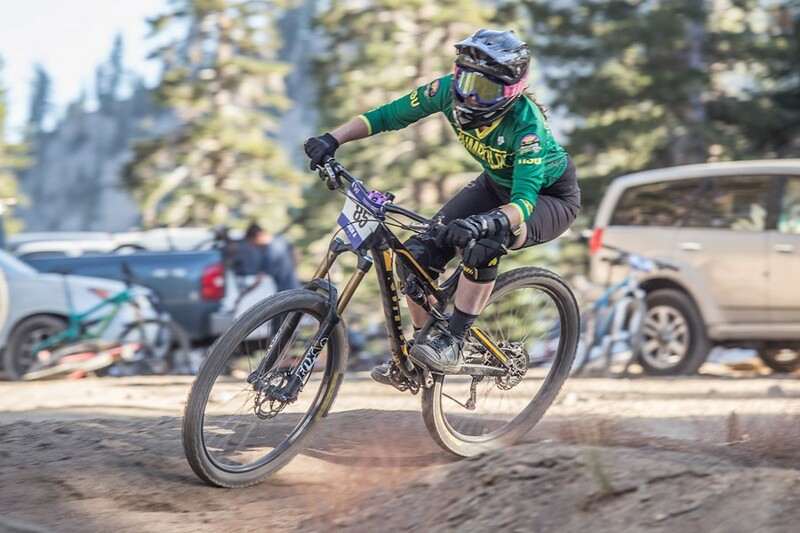 Four Humboldt State University students are competing in this weekend's USA Cycling Gravity Mountain Bike Nationals, which draws some of the nation's most competitive professional and amateur riders. Four Humboldt State University mountain bikers boxed up each of their bikes and then paid more than $400 apiece to have them sent to Snowshoe, West Virginia, and back. The reason? The 2015 USA Cycling Gravity Mountain Bike Nationals. This weekend, HSU’s four riders are competing in the two highest levels of racing, professional and just below in the A-category. “Gravity” races are single-run events that entail a speedy decline down an obstacle filled trail to the finish. This weekend’s events will include the dual slalom, and the downhill — Humboldt’s main focus. In the downhill race, riders have one run to bolt down a trail spanning one or more miles. The trail is filled with sudden and sharp drops, tight berms and crumbly dry dirt. Any mistake can cost riders the entire race. This is the event our Humboldt Four are fond of. And here's a brief introduction to each of HSU's national competitors. Professional downhill mountain biker Ali Osgood winning the women's A category dual slalom event at the Sky Tavern Sufferfest competition. Racing in the professional category this weekend is journalism senior Ali Osgood. 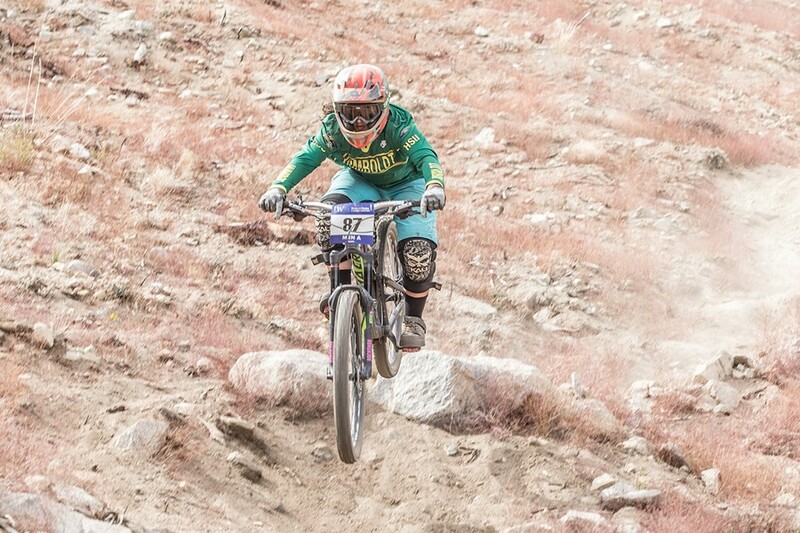 At last year’s nationals, Osgood won the downhill race in the women’s A-category — the highest amateur racing level. Her time of 5:07 would have landed her a fifth-place overall finish in the women’s professional category. Reflecting on that performance gave her the drive that led her to turn professional. This year, she has her eyes on the podium and knows the only thing capable of holding her back is herself. Bo Hellams winning the men's B category dual slalom race at the Sky Tavern Sufferfest competition. 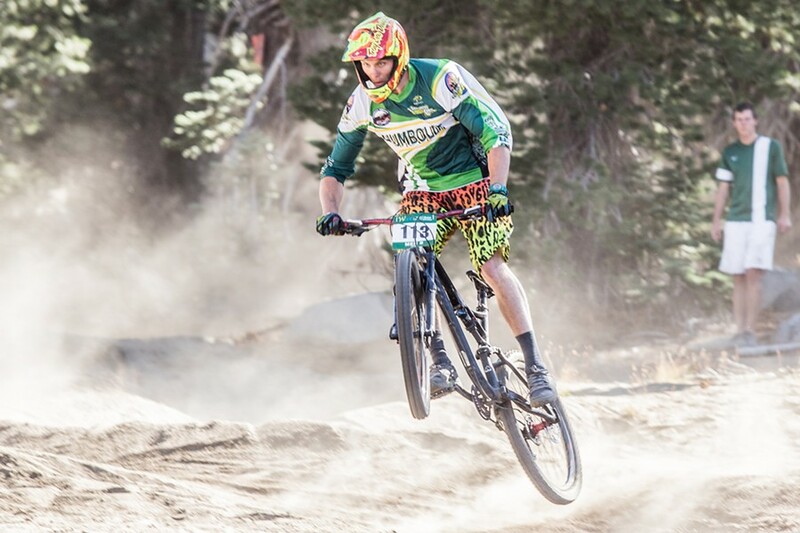 Making his debut on the national stage this weekend is recreation senior Bo Hellams, who only started riding mountain bikes in October of last year. Despite the late start, Hellams knew he wanted to go to nationals, so he bought a ticket to Snow Shoe before the season and school had even started. At his first collegiate race at University of Nevada, Reno’s event, Sky Tavern Sufferfest, he decided to skip the C category. Hellams’ confident racing proved he was capable of racing with the A group. With two first-place finishes (one in downhill, the other in dual slalom) Hellams was bumped up, just as he’d hoped. The following weekend, Hellams hit the Stanford-hosted races and placed third in the downhill race. The weekend after, he took first in Humboldt’s home competition in downhill and fifth in the super-d event, a race that’s similar to downhill but covers a longer distance and requires more endurance. Through these complete races – and wins – he was officially qualified to register for nationals. Sara Schneider winning second place in the women's A category downhill race at the Sky Tavern Sufferfest competition. Humboldt’s third rider is also making her debut on the national stage this weekend, though this is recreation administration senior Sara Schneider’s fourth year riding with the HSU club. So far, her season has been successful and a big improvement from last year, starting with a pair of second-place finishes in Reno, where she closely trailed teammate Osgood. At Humboldt’s home race, Schneider took first in the super-d and second in the downhill, again behind Osgood. Although the two battle on the track, they often train together, share advice and push one another to keep improving. 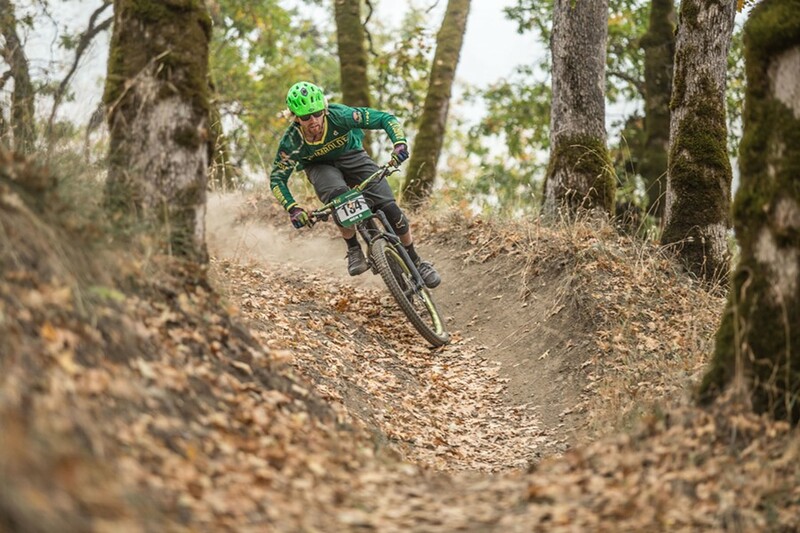 Tyler Green racing in the men's A category super-d event at Lacks Creek, Humboldt's home competition. 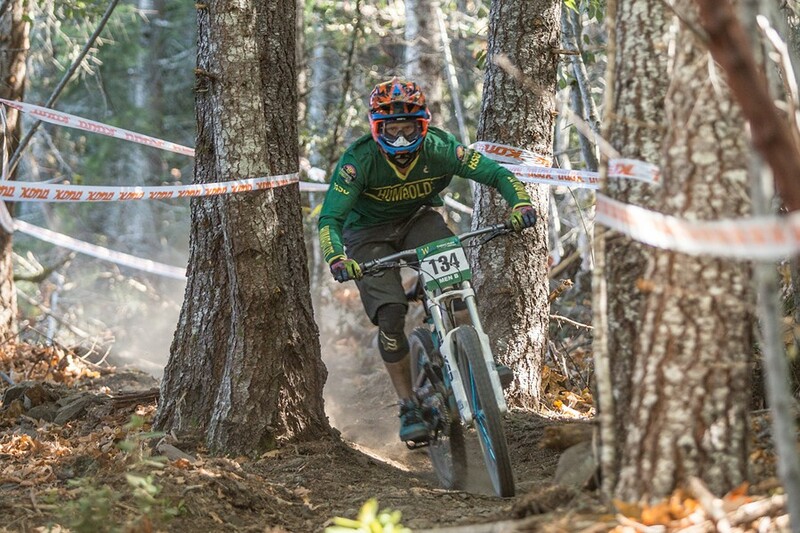 Most recently, Green finished fourth out of 45 riders at Humboldt’s home downhill race. As a junior, he has two more seasons to spend riding with the club and plans to begin training more seriously after competing in nationals this weekend.